Many young patients from outside Montreal who have to spend weeks or even months at the Children’s usually want nothing more than to stay in touch and share their daily experiences with family members who can’t make the trip to see them. Aside from email, phone and video chats, the choices available to them have been limited. But thanks to new technology—and the efforts of several members of the Telehealth team—the future is looking a lot more interactive than ever before. This new technology comes in the form of a robot, one that combines the benefits of teleconferencing with the ability to move from place to place. 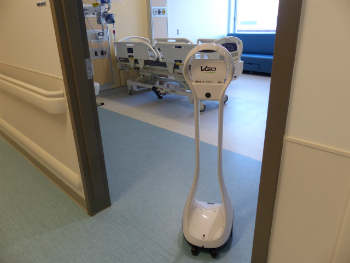 The technology allows users to see and hear each other thanks to a wi-fi connection, and the patient or family member can move the robot with a remote control as they go from room to room, or even floor to floor. Daniel emphasizes that, like all their projects, patient safety is always top of mind. “The robot must be easy to clean to prevent the spread of infection, and it must be easy for patients to operate especially when walking with the robot.” Daniel explains that they’ve already met with staff from certain departments such as Infection Control and IT to address the various safety and operational issues, and there will be ongoing meetings as needs arise. “We want to make sure the project is both realistic and sustainable. As such, this has to be a joint effort from different partners,” he says. In addition to serving patients undergoing lengthy stays at the hospital, the robot could also provide patients who cannot leave their rooms more opportunities to take part in child life and other activities within the hospital. The robot was on hand at the Glen site Open House in December and it made quite an impression on visitors. 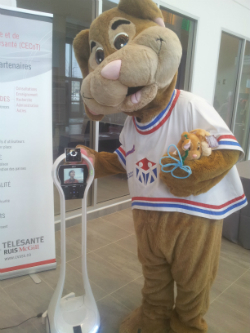 “As far as we know, we’re the first hospital in Quebec to use this technology,” says Daniel. This is the first Telehealth service targeted directly to patients, which fits within the broader mission of the department. The robot has already moved to the new hospital, and the team will start testing it there in March with plans to gradually introduce it to patients over the next year or two. (Photo Above) The VGo robot uses a wi-fi connection to allow users to communicate via teleconference as they move from place to place. The robot's screen panel allows the user to see and talk to people who are logged on at another location.